Where Is the Osprey Saga? I am distressed. 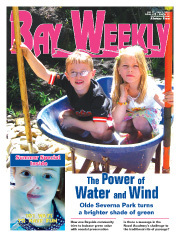 May 20 is the second week that Michael Koblos’ saga of Oliver and Olivia Osprey has not appeared in Bay Weekly. I have been following the story of this osprey family through the author’s firsthand observations. Mr. Koblos’ writing has provided insights into the life of these great sea birds of prey. Please continue this delightful saga without interruption. Editor’s reply: To make up for our omissions, this week we bring you three weeks of The Osprey Saga. In reference to Daniel Manning’s May 20 story. “One More Reason to Love Chocolate,” I send you a chocolate poem. I just bought six dark-chocolate bars. Enjoy the lovely weather and a chocolate drop! yen, the junkie’s need for fix. forgotten for long seasons in a drawer. or merely make me fat? until I choke or croak.